Now that children’s consignment sales are winding down — remember, Wee-Cycle is happening in Milwaukie this weekend! — it’s time to shift my attention to garage sales. My husband and I used to go every weekend for hours BF (before kids) but three in car seats takes alot of the fun out of it. This is why I especially like a good neighborhood garage sale. Pack ’em in a stroller and I’m good to go. I would like to start a list of upcoming Portland metro neighborhood garage sales (SW Washington & Salem too) and I need your help. Please comment with the sales you know are coming up — neighborhood, dates and website address (if it exists). I will start a sidebar list so we can all start planning our summers! Century High School in Hillsboro. 239th Ave, about a block or so south of TV Highway. May 16th. A whole bunch of different sales, all in one parking lot. 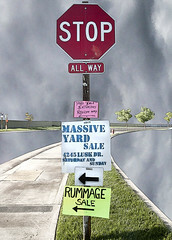 June 27th & June 28th, 24th Annual Eastmoreland Garage Sales – They are GREAT. I've been the last two years and have NOT been disappointed. They have maps with garage sale descriptions and strict times, 8-5, no early birds! Maps are handed out at the local grocer at 8:00, no earlier. There is a great one that I participate in yearly with a bunch of families. All proceeds go to Holt International Children’s Services to sponsor children awaiting adoption. There is usually tons of great children’s clothing and items. It will be 5/16 this year in Milwaukie. I’ll get back to you on the address.